In today's volatile investing market, keeping your eye on your investments is doubly important. StockMarketEye lets you track all of your investments quickly and easily, so you can navigate and profit from the market's moves. Additionally, you can import data from industry standard investment files, such as QIF, OFX/QFX or CSV. You can even add your transactions manually using StockMarketEye's easy-to-use input windows. Review all your holdings together in one spot and gain a better picture of your financial position. You'll be better able to see the big picture and take control of your investment decisions. StockMarketEye lets you track an unlimited number of portfolios. Track your actual investment accounts to get up-to-date information about your net worth and performance. 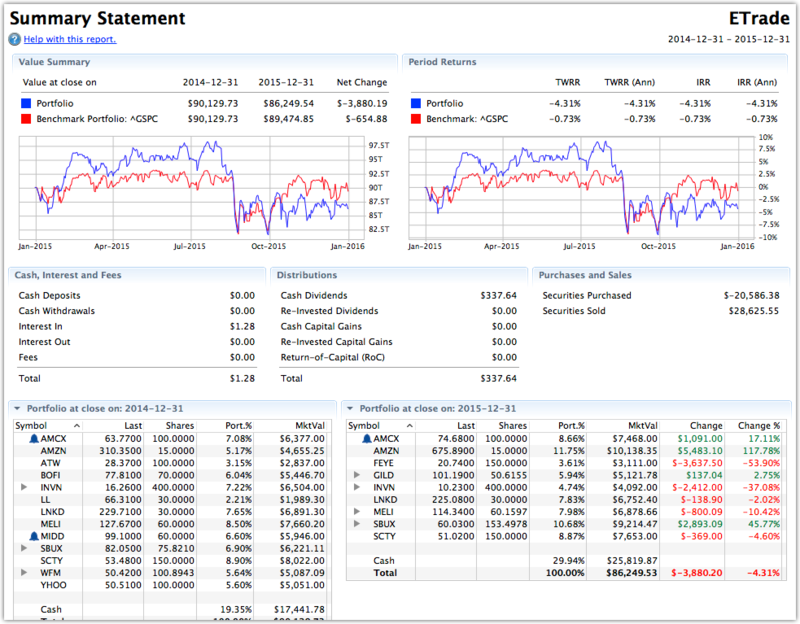 Or test different investment scenarios with virtual portfolios. Using Portfolio Groups and Categories, you can group individual portfolios together as well as and categorize your investments within a portfolio. Portfolio Groups let you consolidate information on multiple portfolios. You can see totals of those portfolios, run reports over the combined holdings, as well as view a virtual portfolio of all their holdings together. A portfolio group can even contain other portfolio groups, allowing you to setup a hierarchy of groups to see totals at different levels. Learn more about using Portfolio Groups and managing them in our User's Guide. Investment categories help you manage the individual holdings of your portfolio. 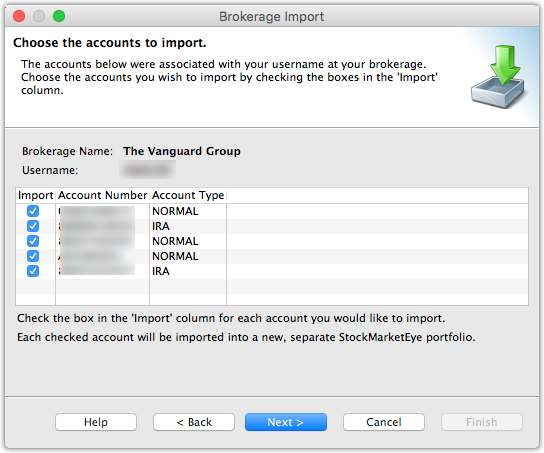 Categories group individual holdings together, giving you separate totals for the holdings contained in the category. As categories can be used within normal, individual portfolios, as well as within a portfolio group's virtual portfolio, you get a powerful way of breaking down and analysing asset allocation. Learn more about Investment Categories in our User's Guide. StockMarketEye gives you the reporting tools to fully analyse your current holdings and your portfolio's performance through a set of powerful reports. The Transactions report shows you the history of the activity that occurred in your account. The Summary report gives you an overview of your portfolio's activity and performance over a specific time period. The Gain/Loss report shows you the gains and losses you have on your positions - both open and closed positions. The unique Back-in-Time report allows you to view what your portfolio looked like on a specific day in the past. 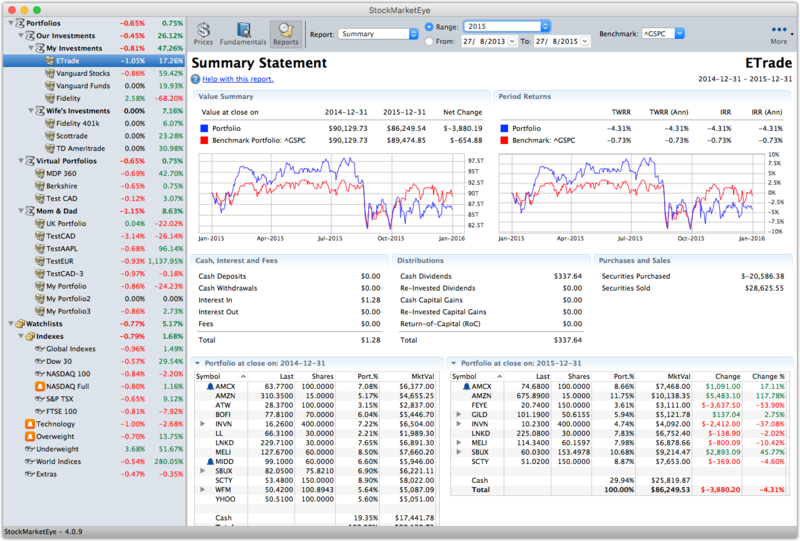 Whether you're tracking your actual brokerage accounts, or just running just-for-fun simulations, StockMarketEye has the features you need to help you get the right information. StockMarketEye has powerful multi-currency support. You can track holdings from around the world and include foreign stocks in your portfolios. The current exchange rates are applied to your foreign holdings, letting you see the value of the holdings in both your currency and the foreign currency. Historical performance reports also use historical Forex rates so you get performance numbers that include currency rate changes. Get the complete picture of how much income is generated by your portfolio and track the yield of individual investments so you can plan for the future. StockMarketEye provides a number of specialized columns to help you better analyse and plan out your dividend portfolio. You can track relevant data for individual securities and your portfolio, such as dividend, yield, forward dividend, forward yield, payout ratio, YOC, and income received. Cost basis information lets you know how much you paid for your investments. Combine it with current market values and you get your profit or loss. StockMarketEye offers standard lot-based cost basis calculations as well as average cost basis calculations. Both calculations are always performed and available for analysis. You can choose, at the portfolio level, which is the default calculation method for your portfolio. See how the value of your portfolio has changed over time using the portfolio's value chart. 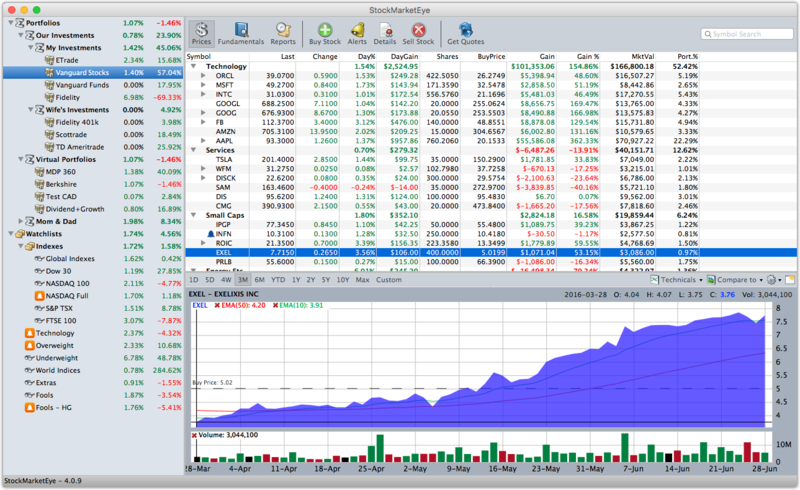 Based on your historical transactions and historical stock prices, visualize how your portfolio has grown in value. Add an extra dimension to your analysis by using a comparison symbol in the chart — see how your portfolio's growth compares vs and index. Why spend valuable time maintaining spreadsheets just to keep track of your investments and the markets? Let StockMarketEye do it for you and use the extra time to research your next move. Use watchlists to keep track of your investment ideas. 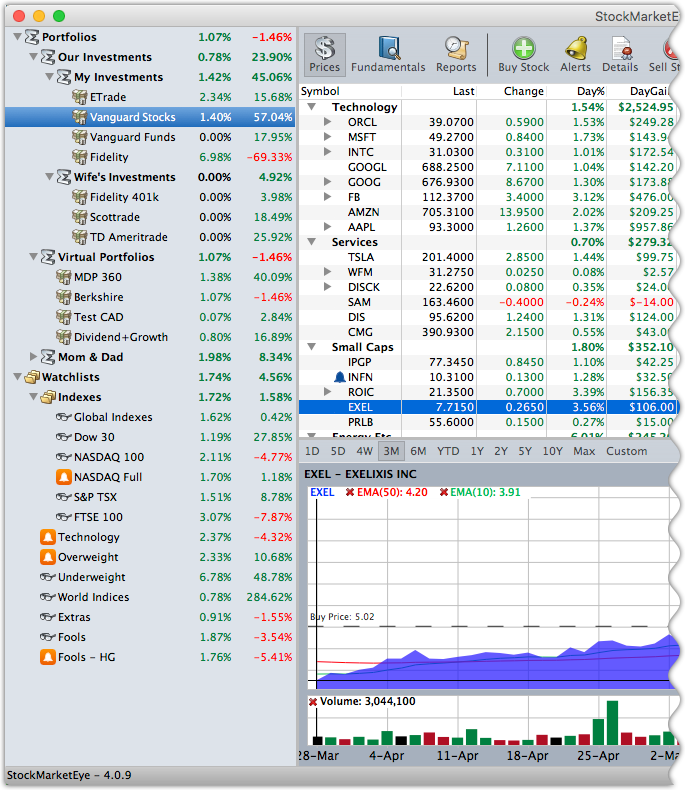 Watchlists are so easy to use, you'll be able to track 100s of stocks, ETFs, funds, currencies and options with ease. You can group watchlists and even add categories to organize your watchlists. 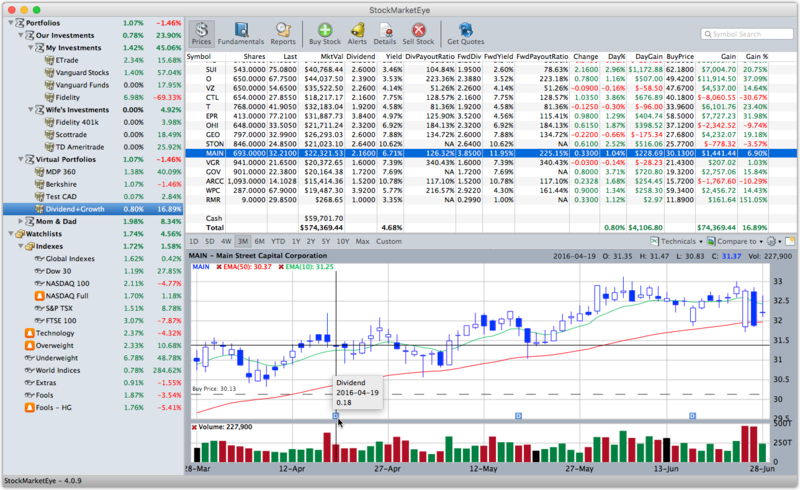 The built-in dynamic stock charts allow you to visualize past performance. Add any of the 14 configurable technical indicators. 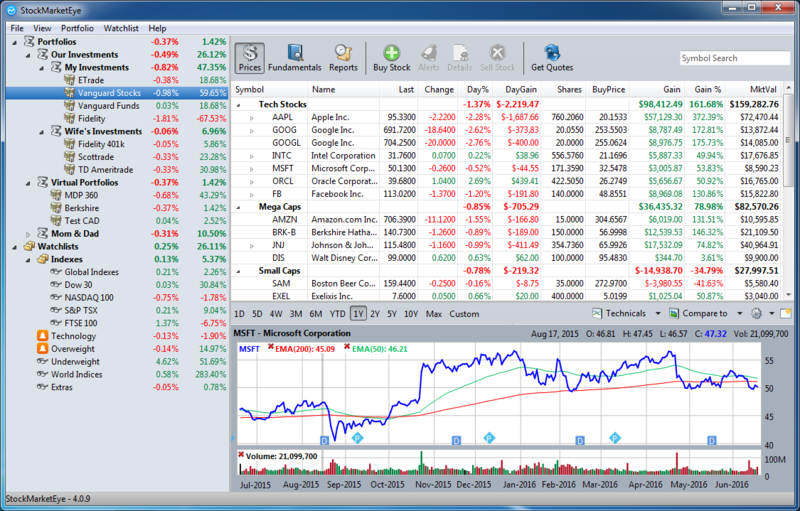 Compare the charts of multiple stocks. 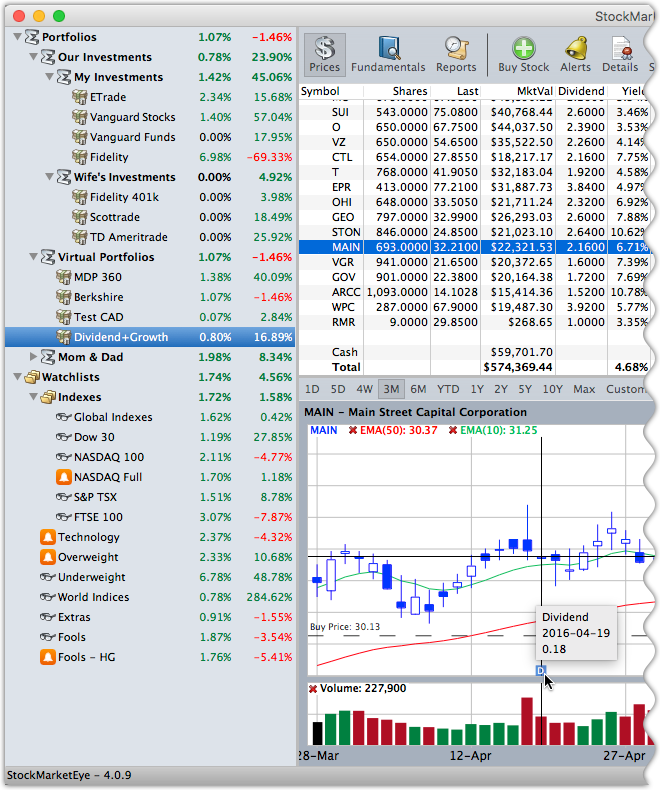 Open multiple chart windows to view more at once. Don't miss important activity. Use price alerts to be alerted when one of your stocks makes a significant move. Alerts are displayed within the StockMarketEye window, and, with the help of Growl, also as a notification window on your desktop. Keep the same investment data on all of your computers and devices. The on-line synchronization service allows you to take your data with you by synchronizing to our iOS app or Android app apps, or StockMarketEye running on another computer. This is not only one of the cleanest-looking but also one of the easiest stock trackers we've used. I've never used a program to monitor the market before but this product is great. It is a simple, yet powerful tool. I can see everything I want to quickly and easily. The charts are extremely easy to read and setup. I have already noticed a boost in my investor confidence level in just a week of using it.